At first sight, affiliate marketing is simply a dream come true business: No own product creation, no storage of items, no shipping, no customer support, etc. Unsurprisingly, almost everyone online want’s to make use of this model of generating commissions for promoting other peoples products online. But truth is, more than 95% of newbies fail to do affiliate marketing with success. To support your smooth start or expansion in affiliate marketing, I have collected the most common reasons why people fail doing affiliate business successfully in the following. Affiliate marketing is a very crowded business area. Hence, you need to find ways to stand out from the crowd. These ways are paved on the quality approach: The content you create to address your audience has to be either great of help or very entertaining (or both) to capture your audience. If you can’t capture your visitors, they are off and gone forever. If you just try to copy your competitors content with some few changes to avoid duplicate content, you won’t attract anyone to listen to you. You have to add or invent your very unique own value and tone to whatever topic you create content about. Don’t just echo what the supplier says about his products you promote. Try to act from a users point of view and answer questions that haven’t been answered before, try to give some extra tips to use the product best or to combine it with other products, for example. By the way, the core of your outstanding value is best provided on your own online foundation, which is your website or blog. 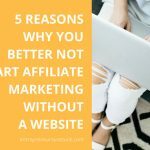 Doing affiliate marketing without a website or blog is something I absolutely do not recommend, for several reasons. This is a big one, too. Many affiliates don’t take the effort to dive into the products they want to earn commissions from. They think it’s enough to provide superficial product information. 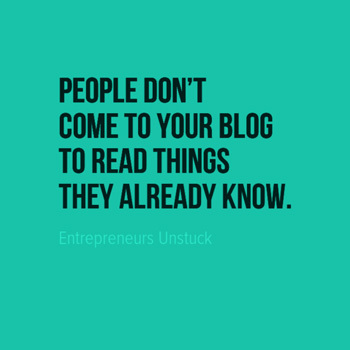 But your visitors don’t come to your blog to read things they have read somewhere else before. They seek for reliable extra information, which in best case come from a user knowing the product inside out. In best case, you promote products you have achieved great results with using them for yourself. If you show your achievements of using the product, you can give great and very credible advocacy for it in front of your audience. That way, you will achieve much more success than those who promote products they are not connected with (but expect to make money with because they are meant to be bestseller). Affiliate Marketing is popular for not having to do customer support for the products you promote. But that’s only half the story: You may not have to solve technical problems customers have with your affiliate products. But for being one of the very few succeeding in affiliate marketing, you have to get and stay in touch with your audience! If you don’t want to get in touch with your audience, you have to attract hit and run buyers over and over again, which is lots of hassle. In affiliate marketing, strong relationships are mainly built on great helpful content and your interactions with your audience. Try to offer help whenever you can and deliver it when people ask for it. Go and answer questions people leave in your comment section or on social media. Along the process of creating your affiliate business you should start building your own email list your visitors subscribe to. That way, you can implement a funnel to send them emails containing awesome helpful information suited to their needs. These funnels can create very strong, long lasting relationships between you and your subscribers. The ability of your business to scale depends very much on your efforts to build relationships. And good relationships are made of trust, which leads me to the next point! I once had a mentor in the offline marketing world who taught me something very wise you should apply to any business: If you want to sell something, do ANYTHING but, by all means, not this: selling. People start businesses and all they can think of while building it is “I have to make sales!“. 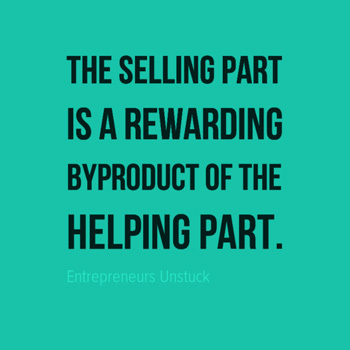 They are madly chasing after sales and forget to do what actually leads to a sale: Helping people. But… As soon as you switch into helping mode and make helping your audience your main mission in your daily content creation and interaction tasks, it doesn’t take long to see amazing results coming in. But why is helping the key? Because, in helping mode you don’t push people to buy something. Instead, your actions are based on digging for problems of your audience to deliver a perfect match solution to them over and over again with your blog posts, videos, podcasts, etc. Helping people leads to something money can’t buy: Trust. If you honestly want to help people with what you do in your business, you will be rewarded with trust. There is no sale, not a first and definitely not a repeat one, you can make, if your (potential) customer doesn’t trust you. List building is a good example for how things can go wrong in the lack of trust: Many affiliates bombard their freshly generated subscribers with series of emails (funnels) that contain nothing but frantic sales offers right from the beginning. Instead of sending trust building emails first (like how to‘s or tips and hacks on relevant things), these affiliates push their subscribers to buy something up front. And instead of conversions, they are “rewarded“ with people unsubscribing from their list because they feel annoyed by spam. If you want to stand out from the crowd in affiliate marketing, you have to switch into helping mode and aim to know and serve your audience better than anyone else. To be honest, niche selection – hence, choosing the field of interest you want to build your affiliate business in – has been a big challenge for me in the beginning of my online trip. And it looks like it’s a very common struggle for many newbies who are just starting out. Most people are tempted by the thought of targeting a BIG market with their affiliate business. But generic, huge markets come along with two problems: They are likely to be very competitive, and they are no good for finding targeted audiences. Therefore, it’s very important to specify your niche to a certain level. Need an example? Okay, let’s say your root niche is about toys. That is far too broad. To make it more specific (less competitive and more targeted) you could say you focus on toys especially made for “infant cognitive development”. Imagine you write a great guideline like “5 things important to know when choosing toys for infant cognitive development” on your blog. If someone googles the search term “toys for infant cognitive development“, he will see your post popping up in the search results. The search that person has performed is very specific and your content is a perfect match answer for it. That’s how targeting works – you address visitors that are highly interested in the content you create. Reason 2: your content fits perfectly to a specific search query (toys for infant cognitive development) not too many other strong websites offer helpful content for. It’s a little bit about finding questions people ask relatively often on the internet (search queries in search engines) but don’t get many suitable answers for (in the form of relevant website or blog content). On the average, the search term is searched 96 times in the search engines per month. But there is only one website providing relevant content to answer that query. This is low competition at its finest! You may say “Why should I target for that low traffic of only 96 searches?“. Well if this post would be your only one, that’s very poor traffic. But if you write many posts suited for that kind of low competition search terms relevant to your niche, you will get lots of top rankings in Google which boosts the overall ranking of your blog. I see this over and over again and have to admit I have been tempted by it too: Once you understood how a profitable niche business works, you want to build many of them to maximize your affiliate incomes. For many of us, especially the starters, this is failure sure to follow. I don’t say affiliate marketers who centralize their business on only one or a few websites are more successful than those who run a huge amount of affiliate websites. It depends on what kind of person you are and how experienced you are in this business. Not everyone has the jack of all trades capabilities needed to keep on top of it! Even if it’s possible to manage several niches at the same time, it definitely is no good model for newbies to start out with. Building up an affiliate marketing business is way more complex than one might think. I see many starters who underestimate the workload related to this business. They end up in having several niches where each one of them lacks proper contribution and care to really take off. This results in many niches with only little to no income. Sooner or later people get frustrated and give up. I always say start with one niche and grow it laser focused to a profitable business. At that point your expertise and routine is strong enough to step into more markets or try other business models. Your income opportunities depend very much on what kind of affiliate products you choose to promote. You just have to be aware that products with relatively low pricing result in relatively low commissions you can make per sale. But to sell 132 items each day, you have to generate traffic to your site that comes close to a 2,650 visitors each day or nearly 80,000 per month, assuming you achieve a conversion of 5%. That’s a lot of traffic you have to build! 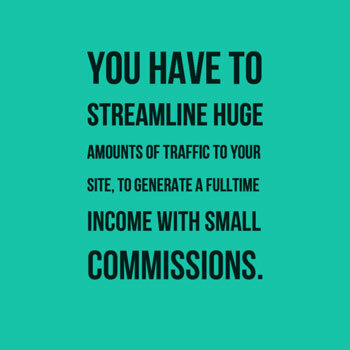 I don’t say affiliate marketing with low priced items is impossible, but you just have to be aware that you need to generate much more traffic to achieve the same results you get with higher commission products. Just for comparison: If you promote a product with a commission of $25, you only have to sell 7 of them each day to make $5,250 per month. With a conversion of 5% you need 140 visitors per day or 4,200 visitors per month in traffic. But I have to warn you against thinking it further and concluding the higher the price, the more money you make. The higher the price of a product you want to earn high commission for, the more effort you have to put into building trust to finally make the sale. That’s a challenge you should not run into as a newbie. In best case you take care to have a good mixture of products that provide good and moderate commissions. Even though market conditions for affiliate marketing are on the change into “quality wins“, the online referral business still has the image of an easy peasy push button get rich overnight thing. This image is mainly caused by the heaps of scammers who promise newbies that their get rich quick schemes will bring them guaranteed success on autopilot. To be honest, the whole online industry is pretty much “contaminated“ by these rip offs targeting internet novices that desperately try to make money online. These scams come disguised as online marketing training products or as faked affiliate program or as a combination of both. Watch out for scam lingo like this! Tons of newbies have painfully experienced these scams and gave up before they had the opportunity to see the real good potential of affiliate marketing. So whatever training program you step into to learn the business, make sure that you will always be the owner of your business (and domains), that you don’t end up in an endless upsell machinery that is very often attached to scams. And if you see affiliate programs that want to charge you to promote their products, stay away from that! Many scams are based on MLM (Multi Level Marketing) or pyramid schemes disguised as affiliate programs. These illegal fraud empires rip you off first, to then make you rip off other people. There are many many things you can test and tweak to achieve great improvements in traffic generation, user experience, conversion, etc. But for some reasons, many people forget to establish these routines for improvements. It is not something you do a lot in the very beginning of building your affiliate foundation. But as your business grows and traffic increases, you really should take advantage of all the opportunities to optimize your business. I think it’s a huge advantage of doing online marketing that whatever strategy you test, you always get quick response in results. In offline marketing world, you have a much bigger effort to generate that direct response to your offers. What kind of headlines do work best? What’s a good tonality for your audience? How and where to integrate affiliate links? What should call to action look like and where to place it for maximum conversion? What kind of funnel works best? There are endless things that make sense to be tested! But don’t lose yourself in testing either. Always think of what the benefit of a test should be in terms of improvements. Distraction is only a mouse click away and I think that’s sort of the occupational disease of our industry. We sit in our “virtual cockpit“ and can reach out to everything business related (or off topic) through our screens. And when your sitting at content creation for hours each day, you are happy about any invitation for distraction coming from your cell phone, tablet, computer or whatever else device. And then we jump around checking emails, social media, analytics, news and whatever else. I think working all day long on your business is impossible without distraction. Maybe our brain sends us impulses to take a break after writing 2 hours in a row? You simply can not work all day without taking breaks. That’s why I say distractions are a good thing, but we have to control them and we should not let them control us. Allow yourself distractions, but plan them. Just take a short break every 1,5 hours for 15 minutes. Distraction is not something bad you should avoid by all means. If you have been working for 1,5 hours, it’s good for your brain and concentration to take a fresh air break! Sometimes we cheat on us with distractions. We do business tasks we find more interesting while other tasks are much more important to do firs in reality. So prioritize your tasks with first things first and don’t procrastinate things that urgently need to be done to grow your business. Traffic generation is #1 priority (done by content creation). Without traffic there is nothing to measure and monitor in GA and GWT. And even if your traffic engine runs, don’t check your stats several times a day, once a day is perfectly fine! Now we get to the core mindset matters points! No matter how good your affiliate marketing skills are, if your mindset is weak, you will fail. I am pretty sure that the biggest reason for failure in (affiliate) business is caused by inadequate mindset. Whatever your goal is, to persistence is crucial in achieving it. What you need is an iron mans mindset to succeed in this business. You will have many setbacks, like every marketer experiences. Moving on, whenever you get stuck, is what counts. The truth about affiliate marketing is, that everyone, even a complete novice, can make it work. I know this sounds like scam lingo too, but it really is true. People don’t succeed because they are brilliantly smart or fail due to the lack of skills. The “finisher“ succeed, because they never give up. The loser fail, because they don’t believe in theirselves and in what they do. Turn your “I wonder if I can make it“ into “I will make it, sooner or later“. Pay attention to all the small steps of accomplishments you make along your way. And set yourself small goals you can and will achieve. You should make use of a steady strong motivation to strengthen your mindset. That’s why I always say choose a niche that sets you on fire, day in and day out. It’s easy to cheer yourself up in this very moment you read my attempts of encouragement;) The challenge is to keep up that good mindset all through your working day and especially in the moments where you get stuck with something. Make a contract with yourself that says whatever obstacle comes your way, keep moving and never give up. I guess this is all not new to you. And I know we tend to underestimate the importance of mindset. 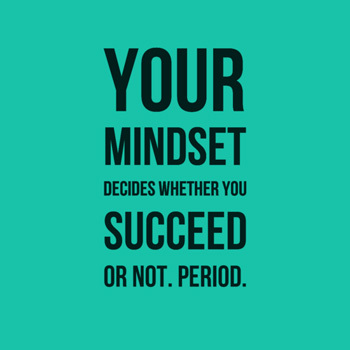 But we shouldn’t because your mindset decides whether you succeed or not. It’s just as simple as that. Your mindset is more important than all the skills you will ever learn to drive your business, trust me on this one. It’s simply a fact that most people give up at a stage, where they are just about to breakthrough with their business. Isn’t that crazy? They give up after an intensive time of working hard, because they don’t see the results they have expected in the time they have expected. The reason why, leads me to the next point. How good are you at being patient? Just as bad as I have been for a loooong time? It’s interesting to see that people who start out in affiliate marketing tend to be very impatient with their business. I repeat myself but again, I am sure this collective eagerness is mainly caused by all the black sheep of our industry, trying to make this business look like a get rich overnight on autopilot thing. That‘s why I always say: The first important thing you should do before stepping into affiliate business, is to reset all the scam hype about affiliate marketing in your brain. In many aspects, affiliate marketing is pretty much the opposite of what these so called gurus want to make newbies believe. If you expect it to take time, you are not tempted to choose shiny strategies to boost your business, which in reality only hurt your business. 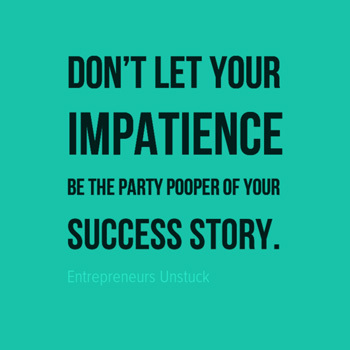 If you bring in the patience, you will stick to the solid strategies that will make you the winner in the long run. Some of those who start doing affiliate marketing based on your own website or blog, which I highly recommend, see first results after a couple of months. And for some of them it takes a year to make a stable income. That depends on how much time you can invest into building your business steadily. But let’s be honest: Whatever business you decide to do self-employed, there always is the part of bringing in hard work first, before you can enjoy all the advantages of great income, flexibility and independence! Most people fail to do affiliate marketing with success – why give it a go? You absolutely can and will succeed in this business, if you stay away from tempting scams, if you learn the skills from mentors you can trust, if you apply your skills steadily, if you don’t let setbacks ever stop you and if you always take care of your mindset, since it’s the most crucial factor in this whole game. I hope you have found some good insights about critical factors in affiliate marketing. 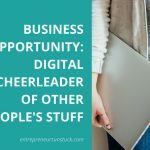 Please share your experiences and expertise in this business below. And if you have any questions – please drop me a line below and I am happy to answer them all! 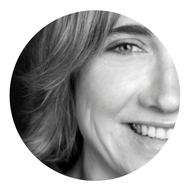 Vera Kuhr is the founder of entrepreneursunstuck.com. 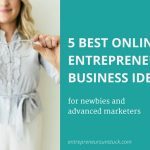 To unstuck overwhelmed, distracted, paralyzed, disillusioned or anyhow else struggling online entrepreneurs is what drives her cheers of encouragement here at Entrepreneurs Unstuck! I find it very sad and infuriating, this is how the affiliate model works, it needs much better government legislation. For the most part, it is an MLM scam. As you can probably tell?. I’m extremely disillusioned with the whole affiliate model. Virtually all newbies are simply unprepared. 1. They have no marketing skills. Very few if any newbies know how to do market research correctly. 2. They have little to no good writing skills. By which, I do not mean not understanding the alphabet. But writing in a coherent blogging manner, in order to convey their message and attract customers, possibly to theirs or a website they are trying to promote. 3. The lack of understanding it is a business, which requires a business like minded approach. Very few newbies probably have business experience or the managerial skills necessary to run a business. 4. Newbies do not understand, they are the ones who have to make it work. Affiliate marketing it is not a click and forget as it mostly advertised. 5. Creative ideas. It’s a biggy. It’s a big stumbling block. 6. Knowing what a niche market is and what their niche is. This is related to point 5. They are interlinked and is a huge stumbling block for newbies. If they do not have skills they can leverage? Finding a niche is almost an impossibility and then the creative idea to make that niche work for them. 8. And for that. The above reasons are why virtually all affiliate marketers fail. 9. I would like to say I’m wrong. Unfortunately, the 99% prove me right. I would like to say a thank you though Vera for providing me with information, “and” above all, you are the 1% Who has made it. Well done, and all the best in any and future business ideas you might have. Really awesome article. Thanks for sharing. People fail in affiliate programmes because they don’t have enough experience and they don’t want to get some advice when they need it. When you start such a programme you should have a very good picture of your every step and know what to do in every situation. The main reason I saw no real success through the first couple of years of my internet marketing journey was over confidence! I felt I could cut corners and do things better my own way. Seven years later and I’ve learned the tough way that you have to stick to the rules…and success will always follow! I have to say I learned a lot from your post and you were able to jot my memory on many areas that I have forgotten or strayed away from. Sometimes it’s hard to remember why I’m doing IM and write in a way I like to write, instead of doing it for possible conversions. I have put a lot of effort into learning more about IM and started to tweak my site. I understand there are a lot of variables involved but what is the average time before my site will rank better? Thanks for the great eye opener and somewhat inspiration to grind on! Certainly it is a lengthy article. However, it is self-reflection for me as certain points hit me. 2. Distraction – I admit that at times, I got caught up with social media and certainly it is not a healthy thing to do. Overall, very good article to remind us in terms of what we should and should not do. Thank you. thanks for your feedback! You are so right, most sales people just care about selling, not about if the product suits the customer to make him a repeat customer. With focus on help and high relevance, you will benefit from a huge competitive advantage in building a highly valuable customer base, that’s what I experienced over and over again. thanks for your comment! You are doing great in building your business, keep up the good work! It really is so important to test and tweak, there is so much you can learn from it, especially from the mistakes you make! thanks for your comment! Looks like you have gathered pretty much the same impressions I did. All this MAKE MONEY! and SELL! in our heads often leads us away from what we really have to do to enable us to achieve money goals. If you manage to really focus on doing your business, the making money part will follow as a result. thanks for your feeback, much appreciated! I really think it can speed up your learning curve and success if you know about common obstacles right from the beginning. I once was lucky some great people shared their knowlegde with me and I am lucky I now can forward some helpful insights to the ones just starting out. It is a good idea to not spread ourselves too thin, and focus on the content. Many affiliate marketers are affected by analysis paralysis, and I’ve been there myself. I bookmarked your page since articles like these are good refreshers and can help me to refocus if I find myself wasting time on plugins and analytics. Need to refocus on creating content which I think is the most time-consuming aspect of affiliate marketing.